Zoho Docs © is a one stop shop for a businesses digital document needs. It is a cloud-based document center that allows you to work on all common document types in one place. The online file storage feature of Zoho Docs © means that you can store your files online and conveniently access them from any device in any place with an internet connection. You are also able to have you Zoho Docs © files sync with your desktop so you have all the files of your work computer with you at all times. The files of Zoho Docs © behave as a normal operating system would with multi-level folder systems. Zoho Docs © also gives you file sharing capabilities that are protected by high level digital security. Filing sharing can take a multitude of forms, including sharing files as a link, embedding them on a website, or sending secure files to colleges with unique password access. This secure, easy to use file sharing feature means that the clunky process of compressing zip files and sending as email attachment is (thankfully) a thing of the past. Zoho Docs © also gives you a easy to navigate interface that helps your track what documents ave been shared with who, and who has shared documents with you. Teams get huge benefit from Zoho Docs © in the form of easier collaboration. By sharing files among your team a document becomes accessible (and editable) by a group of people. This can be vital for a team working on a project where multiple people need to contribute. One exciting feature of Zoho Docs © is that multiple people can work on a document and see each others changes in real time. Management of grow work is easy with Zoho Docs © as users can assign tasks, set deadlines, and analyze and review content to keep an eye on how things are progressing. All this means that every member of the team has access to the very latest version of a project and gives a new feeling of life to a document that is a work in progress. Zoho Docs © gives you all the document types of a common system like Microsoft Office ©. Word documents, spread sheets, and slideshow presentations are all options for Zoho Docs © users – and all come with the functions you would expect from a professional office document system. Integration is another strength of Zoho Docs ©. 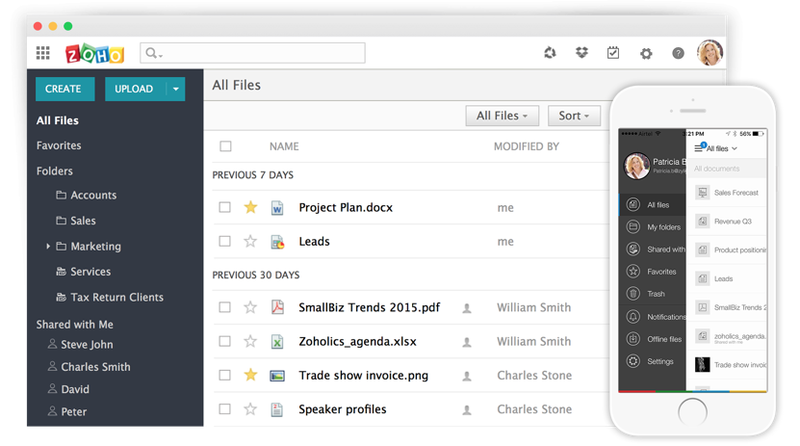 Zoho Docs © can be seamlessly integrated with other online storage applications like Dropbox. Meaning it is possible for you to access Dropbox files from Zoho Docs © and vice versa. Zoho Docs © also connects with Google Apps – making your document management even more powerful . Zoho Docs © also provides an API feature so that companies can construct their own applications and take Zoho Docs © in the precise direction their company needs.